Tomorrow’s Voices Autism Centre is at it again, raising awareness of Autism Spectrum Disorders and Developmental Disabilities. 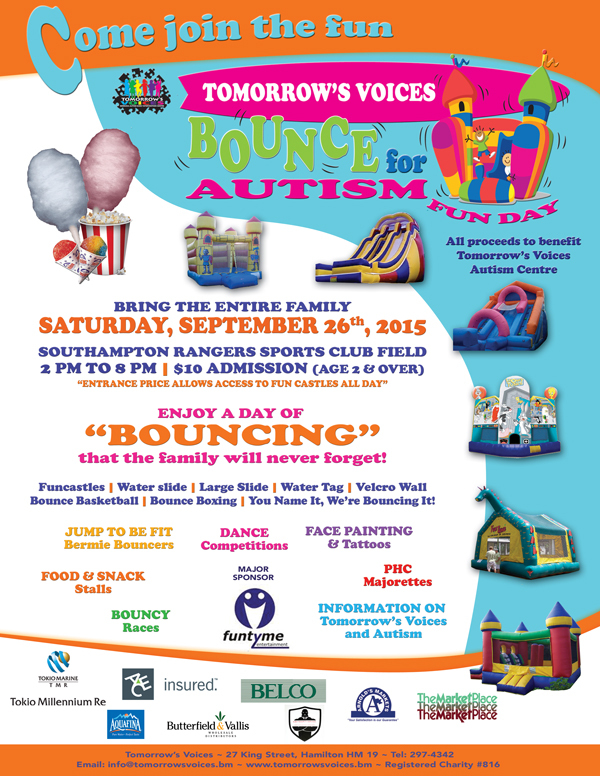 “On Saturday, September 26th, Tomorrow’s Voices will host its 5th annual “Bounce for Autism” Fun Day at the Southampton Rangers Sports Club, from 2pm to 8pm,” the group said. “Tomorrow’s Voices would like to invite the community to bring their entire family out for a day of fun-filled activities, including bouncy castles and bouncy races, dance competitions, toy stalls, food & snack stalls and face painting & tattoos. “Entertainment will include the PHC Majorettes, Jump To Be Fit Bermie Bouncers and other exciting groups, as well as the Tomorrow’s Voices information booth, all in the name of raising Autism Awareness and support in Bermuda. “Admission is $10 for Adults & children ages 2 and over and includes all-day access to the bouncy castles. All proceeds benefit the Tomorrow’s Voices Autism Centre and the families it supports. “The day was designed to help Tomorrow’s Voices raise awareness of Autism while celebrating those young people and adults who live successfully with the disorders every day. “The event helps to raise funds for Tomorrow’s Voices’ much-needed Centre and services, as well as broaden awareness of the autism spectrum and other developmental challenges that are increasingly affecting families in Bermuda. “For the fifth year in a row, major sponsor Funtyme Entertainment has generously donated all of their bouncy castles in support of Bounce for Autism. “Supporting sponsors of the event also include Tokio Millennium, ACE, D&J Construction, BELCO, Arnolds Markets and The Market Place. Sponsors providing inkind donations include Goslings, Butterfield & Vallis, KJ&K Security and Dunkleys.